1 of 4 Coat a 9-inch springform pan with nonstick cooking spray. Line side with wax paper. 2 of 4 Place ladyfinger halves along side of pan, flat sides facing in. Combine cookie crumbs and butter; press into bottom of pan. Freeze. 3 of 4 Allow ice cream to stand on countertop until softened. Transfer coffee ice cream to a bowl and stir until good spreading consistency. Remove pan from freezer; spread coffee ice cream on bottom. Repeat softening and spreading with vanilla and java chip ice creams. Top with thawed whipped topping. 4 of 4 Freeze overnight. Remove side of pan and wax paper. 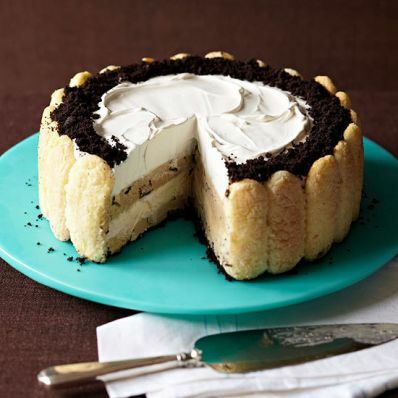 Decorate top of cake with crushed cookies.